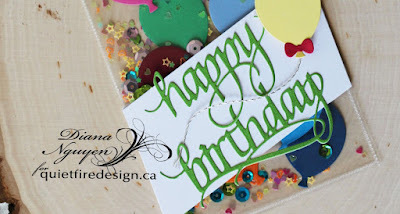 Today I am sharing a fun birthday "card" that is perfect for kids. I don't know about yours but mine always love the more interactive ones - where things move - so they can break it off. Just kidding - but not really. 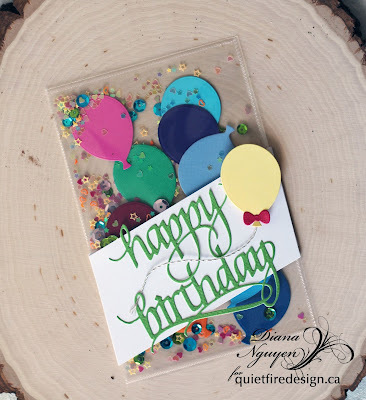 Today's project is a large shaker element that doubles up as a birthday card. I had gotten the Memory Keeper Fuse Tool a while back - for the specific purpose of making sugar cookies and sealing them individually as gifts. It worked out really well but I thought I should use it for more than just one thing to make it worthwhile. So I made this fun birthday shaker for one of my son's friends. It was quite simple but perfect fun for a little kid. The photo sleeve was already sealed on three sides. I generously added sequins and shaped glitter to the sleeve. I then die cut the balloons from Elizabeth Craft Designs Balloons out of all my stash of scraps. So that all the balloons would not fall to the bottom of the shaker, I adhered some of them to the photo sleeve on the back. I then added a diagonal panel of white cards stock across the front and adhered a green die cut of Quietfire Design's happy birthday 2. I also popped up a yellow balloon and silver twine. The back of the shaker also has a white panel where my son could write his message. Hope you like my card that is not a card! I love your card that is not a card. So clever and I love all the like details. I had to have a Fuse tool and have never used it. This looks like a reason to open it up. Thanks. Will any kind of photo sleeve work or is it a particular brand?